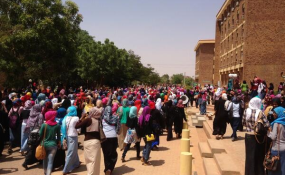 Khartoum — Thursday witnessed various protest marches in which thousands of Sudanese people participated against the regime of President Omar Al Bashir and its newly imposed Emergency Orders. As a result from the State of Emergency, dozens of arrested protesters have been sentenced by the Emergency Court. Khartoum alone saw more than 25 peaceful marches demanding the immediate step-down of President Al Bashir and his regime from the country's rule. Journalists and witnesses told Radio Dabanga that participants in the peaceful marches which started in Khartoum at 1pm purposely blocked a number of main roads. Meanwhile the Sudanese security forces faced the demonstrators with extreme violence. Journalists said that there were a number of arrests that immediately led to trials of the demonstrators. The freshly established Emergency Court deals with these cases. One of the Emergency Orders that have been issued since February 25 under the new State of Emergency, prohibits blocking public roads and obstructing the movement of citizens and means of transport. Any person who violates the provisions of this Order faces imprisonment for a term not exceeding ten years, and a fine. Journalists and activists said that a number of lawyers have volunteered to defend the detained demonstrators from Omdurman and Khartoum who are to face the Emergency Court. A number of defendants were already sentenced to two weeks' imprisonment and paying a fine of up to SDG2,000 for their actions that violated the new Emergency Orders, activists informed Radio Dabanga. The head of the defence team of the demonstrators, Muez Hadra, said that on Thursday the courts in southern and central Omdurman began activating emergency courts, where dozens of demonstrators, who were arrested from previous demonstrations this week, were tried. "This move is unconstitutional and a violation of the right of demonstrators to a fair trial," Hadra said. "We as a defence body intend to challenge the emergency courts and the prosecution, which was formed by the Chief Justice and the Attorney-General on Tuesday." Sudan's declaration of the State of Emergency has been widely criticised, including by the UK, USA, Norway (known as the Troika) and Canada. In a statement this week the countries voiced their concern that "the return to military rule does not create a conducive environment for a renewed political dialogue or credible elections" and about "the ongoing detention of political leaders, activists and journalists". The 52 prominent civil society and political activists of the Peace and Reform Initiative, also known as the "Group of 52", has declared its rejection of the State of Emergency in Sudan and called on the legislature to shoulder its responsibility to protect the Constitution and drop the decree. The declaration was made "without the necessary constitutional justification", the group said in a press statement released yesterday. The Emergency Orders issued under it "violate freedoms, deprive the citizen legitimate constitutional rights, disrupt the political life and worsen the economic conditions". It pointed out that none of the conditions under which the constitution restricts the use of this exceptional procedure have been met: the current situation in Sudan cannot be defined as a threatening emergency such as war against the country, an invasion, a siege or a natural disaster. "The move is a means of repression and denial of the citizen's right to resort to his natural judge and restricting the freedom of peaceful expression with legitimate political and economic demands in the face of the masses calling for change." The Peace and Reform Initiative, counting among its members Dr El Jazouli Dafallah who served as prime minister in the transitional government after the Sudanese uprising of 1985 that ousted President Jaafar El Nimeiri from power, announced two weeks ago that they will not submit their demands to the Presidency again but instead "initiate direct coordination with the forces behind the popular protest movement to achieve the required change".